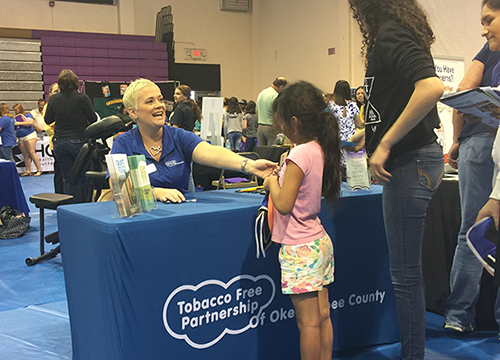 Tobacco Free Partnership of Okeechobee is proud to be the silver sponsor of the Back to School Expo, which was held on July 30th at the Okeechobee High School Gymnasium. This event is open to all school aged students and their families, with approximately 2000 people in attendance. Attendees were able to visit each booth and learn about local services provided, get free back to school supplies, see in person demonstrations from the Okeechobee County Sheriff’s Office K9 unit and also received back to school clothes if needed. The Partnership handed out pens and pencils to the students, and educated attendee on the goal and objectives of our partnership and ways they could get involved. Tobacco Free Partnership of Okeechobee is honored to sponsor this event and is committed to making a positive difference in the lives of our Okeechobee Youth. For more information on the work of the Tobacco Free Partnership, or to become a member, please contact Courtney Moyett at: CMoyett@QuitDoc.com, or visit www.TFP-Okeechobee.org.